Disney officially confirmed the cast of their upcoming family-friendly The Lion King, a live-action take on the popular animated movie. The all-star lineup of director Jon Favreau’s 2019 film will include Donald Glover (Atlanta, Solo: A Star Wars Story) as Simba and Beyoncé Knowles-Carter (Dreamgirls) as Simba’s friend and love interest, Nala. James Earl Jones (Rogue One: A Star Wars Story) will be playing Mufasa, Simba’s loving father. Jones voiced the role in the 1994 animated film. Chiwetel Ejiofor (Twelve Years a Slave, Doctor Strange) will be taking on the role of the ruthless villain, Scar. Alfre Woodard (Luke Cage) has been cast as Simba’s beloved mother, Sarabi. 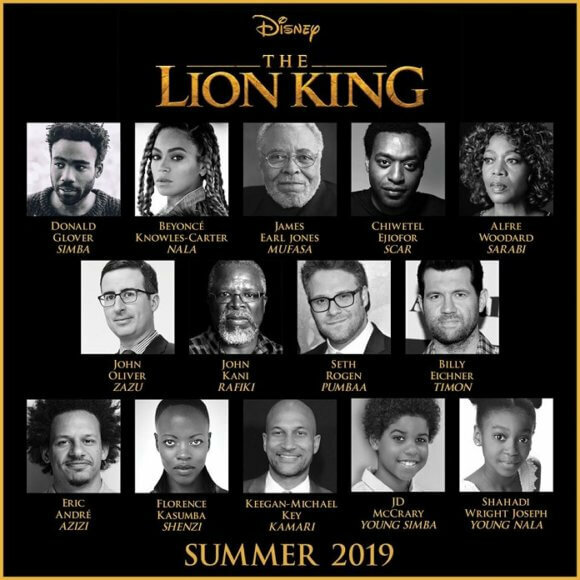 JD McCrary (Tyler Perry’s The Paynes) is taking on the role of Young Simba, the “confident cub who can’t wait to be king.” Shahadi Wright Joseph (Broadway’s “The Lion King”) is tackling the part of the Young Nala. The Lion King sidekicks Rafiki the baboon and Zazu the hornbill are being played by John Kani (Captain America: Civil War) and John Oliver (Last Week Tonight with John Oliver). Seth Rogen (Neighbors) is the warthog Pumbaa and Billy Eichner (American Horror Story: Cult) has signed up to play Timon the meerkat. Florence Kasumba (Emerald City) is Shenzi, Eric André (Man Seeking Woman) is Azizi, and Keegan Michael Key (Friends From College) is Kamari. The live-action The Lion King is written by Jeff Nathanson, based on the 1994 screenplay. Jon Favreau, Jeffrey Silver, and Karen Gilchrist are producing, and Tom Peitzman and Thomas Schumacher are on board as executive producers. The Lion King is set to open in theaters on July 19, 2019. The Plot: From Disney Live Action, director Jon Favreau’s all-new The Lion King journeys to the African savanna where a future king is born. Simba idolizes his father, King Mufasa, and takes to heart his own royal destiny. But not everyone in the kingdom celebrates the new cub’s arrival. Scar, Mufasa’s brother—and former heir to the throne—has plans of his own. The battle for Pride Rock is ravaged with betrayal, tragedy and drama, ultimately resulting in Simba’s exile. With help from a curious pair of newfound friends, Simba will have to figure out how to grow up and take back what is rightfully his.